After months of anticipation, Proxmox VE 5.0 has graduated from beta to release status. In March 2017 we did a short piece on the Proxmox VE 5.0 beta and have been tracking its progress since then. With this new release, Proxmox VE further extends its technology leadership in the open source hyper-converged platform space. At STH our introduction to Proxmox VE came when we wanted to use something “cheap” (open source) to set up an initial hosting cluster years ago. As I meet folks in the community who use Proxmox VE, this is a common path. 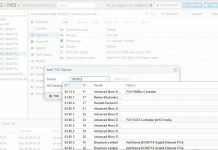 Proxmox VE has a slew of features from the open source community all packaged neatly with cluster management and a GUI. For example, if you have a single node and want to use ZFS plus KVM as a hypervisor, Proxmox will handle that. Likewise, if you want to have LXC containers hosted with a Ceph storage back end, Proxmox can handle that scenario as well. Features such as live migration are supported with VMs either scripted or with the GUI making it a relatively simple process. Since it is built on Debian, and largely based on open source standards, even a novice Linux admin can maintain a cluster with the help of a popular website. If you are trying to setup a budget constrained hyper-converged cluster that you can later get commercial support for, Proxmox is an attractive solution. 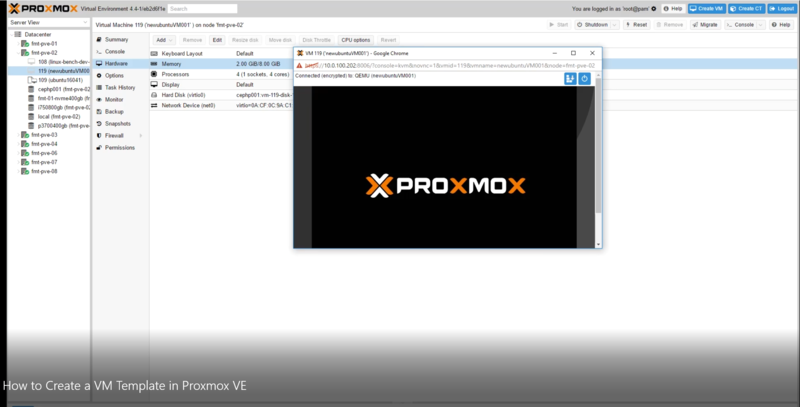 If you are an SMB service provider that is having customers balk at VMware and Windows licensing costs, Proxmox is going to be a solid solution. Based on Debian Stretch 9.0 with Kernel 4.10.15. This is important for compatibility reasons for systems such as the new AMD EPYC platforms. For ZFS, new asynchronous storage replication feature (in technology preview) that can replicate data across nodes and allow migration of VMs between nodes. Ceph v12.1.0 Luminous (technology preview) updating Ceph to a more modern foundation on Proxmox. Live migration with local storage – this is a major feature that home lab and small installation users have been clamoring for. 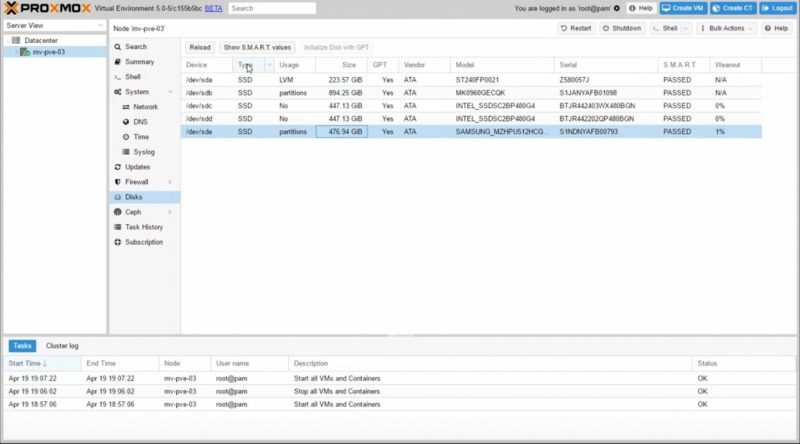 USB and host PCI address visibility in the GUI. Improved VM imports from other hypervisors. “USB and host PCI address visibility in the GUI” – am interested to see if this new Proxmox fixes my long-standing issue of not being able to get my LSI 3008 mini-SAS controller passed through to my Ubuntu Server 16 LTS VM. I attempted many times to get this to work with various options with no success. It keeps giving me “mpt3sas_cm0: fault_state(0x2622)!” errors. ESXi 6.5 works flawlessly so went back to that. Is Proxmox VE 5.0 better than xenServer 7.2? Great question for the STH Forums. Does it still have an issue with backup from Ceph to NFS storage?